Food-wise, it seems that people travel to East Boston for two reasons: Santarpio's and Rino's Place. They've both been institutions in what is called Eastie (Rino's Place has been around for about 25 years). The wait at Rino's Place can get so long that they opened a bar/cafe across the street called Prima E Dopo (which means Before and After) that they suggest people go while waiting. I purposefully came at an odd hour, around 3:30pm to avoid both the lunch and dinner crowds. I got seated immediately but the restaurant was still more than half full. 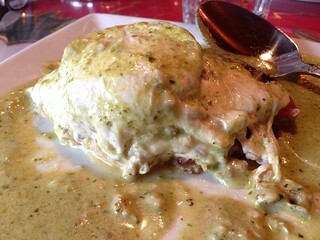 Layered eggplant with mozzarella and creamy pesto sauce. You can order half or a full order. The half is already plenty and is only $6. Eggplant parmigiana is one of my favorite comfort food and I knew I was going to like this variation since I love pesto. I was right and I had to stop myself from devouring the entire thing since I still had another dish coming. 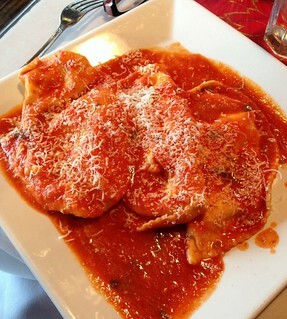 I came for this: the housemade ravioli filled with ricotta cheese. This dish is nominated for Best Pasta for the upcoming Chowzter North American awards. 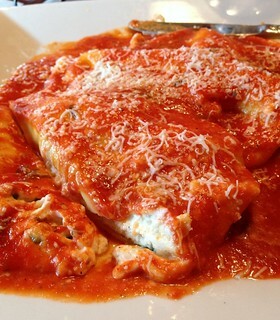 (A similar dish but stuffed with both lobster and ricotta has been featured on Food Network). I was surprised by the size of the ravioli when it came. They were gigantic! They were soft in the middle and al dente around the folded edges. But the key to this pasta is really the herb ricotta cheese it's stuffed with. The ricotta was fresh and the texture was amazing. Light as a cloud, a slight tanginess, smooth. Perfect with the classic tomato sauce. This pasta really highlights the ricotta, but I still want to come back and try the lobster ravioli next time! 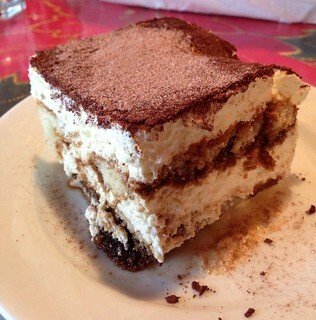 Since I'm at such a classic Italian gem, I of course had to order one of my favorite desserts, tiramisu! Again, a generous portion of a well executed classic. I can see why Rino's Place still attracts so much attention after more than two decades. Don't want to wait in line? They take reservations if you have more than 6 people in your party. Otherwise, do what I do and have a really late lunch.